New York Mets closer Bobby Parnell, who underwent Sept. 10 surgery in California for a herniated disk in his neck, has been fully cleared for baseball activities. After attending David Wright‘s wedding, Parnell stayed on the West Coast to be examined by Dr. Robert Watkins, who had performed the procedure. Watkins cleared Parnell for full baseball activities. Parnell is expected to resume closing games for the Mets this season. He converted 22 of 26 chances last season. “He looked terrific — toned, strong, limber,” said one person who recently saw Parnell. Parnell had lost roughly 30 pounds while dealing with the herniated disk. 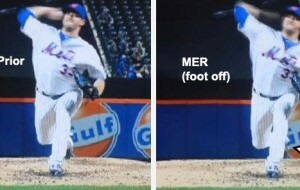 This is a key development for the Mets bullpen. The back end of the bullpen would be a huge question mark if Parnell were not ready for Opening Day. They’d have to figure out who would close, and who would handle the eighth inning. If Parnell is ready, the concern then shifts to who sets him up, which is less of a problem – but still an important one. Right now, Vic Black, who has 18 major league appearances under his belt, looks like the front runner for the eighth inning role. The team is also looking to acquire a veteran to possibly fill that role (someone like LaTroy Hawkins – but he’s in Denver now). LHP Josh Edgin, LHP Scott Rice, RHP Carlos Torres, RHP Jeurys Familia, and RHP Gonzalez Germen are leading candidates to round out the bullpen in 2014. Newly acquired RHP Ryan Reid may also be in the conversation along with minor league lefty Jack Leathersitch and RHP Jeff Walters. Good news, no doubt, and a milestone, but IO wouldn’t call it a key development just yet. There will be uncertainty until he shows his 2013 form at least in some ST games. Yes, for once they have a list of internal options in the pen that are live arms, but they still need to fortify with one veteran that can handle late game duties if need be.